Our 10-day excursion to Sicily with the Food and Culinary Professionals Dietetic Practice Group of the Academy of Nutrition and Dietetics gave us an insider's look at Sicily's wine production and cultural heritage. We began our tour in Palermo and started making our way counter clockwise 3/4 of the way around the island. Our third day was a busy day, as all our days were. We visited the western coast of Sicily, touring the Salt Pans and the Florio Winery in Marsala in the morning, then traveled to Erice, a medieval town - said to be the ancient birthplace of Venus - in the afternoon. Being a trained pastry chef, I especially enjoyed visiting Erice - known for its pastry shops. The Salt Pans in Sicily are located on the coastline, between the cities of Trapani and Marsala. In this area, salt is extracted from the seawater using windmills that move the salt through the pans - a procedure that the ancient Greeks and Phoenicians once used when they colonized that part of Sicily. Migratory birds like herons and flamingos stop along the Sicilian coast on their way to Africa in the autumn, but in spring, our timing did not coincide with the birds migration. 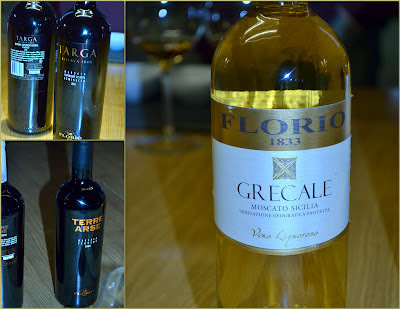 What was not to like about taste testing Sicilian wines! Florio Winery was founded in Marsala in 1832 by Vincenzo Florio Sr.* Their wines have improved over the years and were not nearly as sweet as expected. *The Florio family sold their winery to the Cinzano family in 1924. World War II resulted in severe damage to the winery. A major renovation was completed in 1984. In 1988 the winery changed hands again, and is now owned by ILLVA Saronno Holding company, which is breathing new life into their wine sales. Our tour bus could get almost to the top of Mt. Erice, but motor vehicles could not go the entire way. We put on our walking shoes and enjoyed some exercise. Once in Erice, the view overlooking the city of Trapani was spectacular! Sicily has several castle remains. Two castles are located in Erice: the Pepoli Castle (now a hotel), which dates to Saracen times, and the Venus Castle, which dates back to the Norman time period. We were near the Venus Castle. We walked along the cobble-stoned streets and really enjoyed visiting this area. Erice was a highlight for me because I had the opportunity to meet famous pastry chef Maria Grammatico, who is featured in the book Bitter Almonds, written by Mary Simeti. Chef Grammatico has an interesting story of how she learned Sicilian pastry art after World War II in the convent of San Carlo in Erice. As soon as we got back to the States, I ordered her book in English. In Sicily, Maria only had her book available in Italian. I'm inspired by her classic Sicilian pastries and hope to make some of her recipes. Maria Grammatico's baked goods and confections were truly works of pastry art. I could have spent the whole day there. Her shop was welcoming and she was super nice too. While there, I took a sneak peak at her kitchen and took many mouth-watering photographs of her amazing Sicilian pastries, including dolci di Badia, Sicilian cassata, tortina paradiso, frutta martorana and biscotti di fichi. Her pasticceria uses classic Sicilian ingredients, including figs, honey, almonds, citrus and ricotta cheese. Watch for our Day 4 culinary adventures at the Anna Tasca Lanza Cooking School. Every day was better than the next in Sicily! Blog post and photographs Copyright (C)2012 Wind. All Rights Reserved.